Who can resist to the beauty and elegance of the long earrings? They are so rich in texture, design and style that even your most casual and basic outfit could instantly turn into a prêt-à-porter look from the fashion show podium. In today’s fashion blog we will explore different in length and style long earrings that will make you fall in love right away. However, these styling tips are not only based on super long impossible to wear on a daily basis earrings, but a rather mix of different styles. These amazing jewelry pieces could be worn with literally any style. The trick is to color coordinate them accordingly and pick up the right size. A great rising trend that is just here to help us easily make any of our looks flawless and stylish. I hope you will enjoy these following styling suggestions! Let us begin with one of the coolest style in today’s blog post. The hipster inspired outfit that is perfect for the more “out of thebox” thinking people. In addition, this look is great if you are still a student or working something related to fashion. In this case you can wear your favorite comfy and even a little slouchy outfits. A cool embellished pair of jeans for a unique wear. After all, these patch, embroidered and embellished with gems and crystals design are so interesting and catchy. Then, just add a top that is appropriate for the season and the occasion. In addition to your long statement earrings, feel free to other jewelry pieces such as a stack of delicate necklaces, especially if you are wearing a V-neck top. Your long earrings could be colorful or monochrome, depending on your personal taste. For your casual, yet hipster days don’t hesitate to add a pair of colorful long statement earrings to make your days brighter and looks more festive and trendy. These two pairs are from Happiness Boutique and they are just so awesome! All the ladies that like to keep it neat, chic and classy you can still take advantage of this wonderful long earrings trend. Especially if you pick up monochrome earrings that will simply enhance your outfit. What a better way to make your all black outfit more interesting and complex than by adding some statement earrings. In this case, you don’t need to go for super long earrings, but it is however nice if they are more visible and chunky. Or, based on your overall outfit, a pair of silver or golden plated earrings with some dangling elements is also a very chic option. This is a great choice because it doesn’t look very serious and professional, yet you end up with a very elegant look. Our all times favorite everyday look is a top paired with jeans. Most people that we see on a daily basis or cross on the streets of our city wear jeans. Jeans are such a convenient clothe because we can style our pants according to our mood, character and occasion. In addition, jeans could be worn with almost any type of earrings and for this reason they made it to our listing today. Just throw your favorite top, a pair of jeans and finish off the look by adding some long earrings. It is the perfect finishing touch. The best thing is that you can wear such jewelry pieces with hairstyle and still look super sharp and sleek. In addition, these earrings are particularly great for the busy ladies that need the perfect accessory on-the-go. Here are two very eye-catching pairs of earrings from Happiness Boutique that would perfectly compliment your jean outfit obsessions. In case you don’t “have” anything to wear in your wardrobe at least these beauties can jazz up anything you pull out of that closet. Anyone who likes to attract people’s attention through fashion, then these following styles are for you. Street style inspired outfits are always so interesting to watch and get inspiration from because it is a truly unique style. For example, a velvet ensemble that you can pair with these so trendy sneakers and a small purse to keep your essentials. Of course, as for accessories feel free to add a soft velvet choker and a big pair of earrings. If you happen to have an already amazing outfit, then pull up that gorgeous hair and show your long drop earrings. 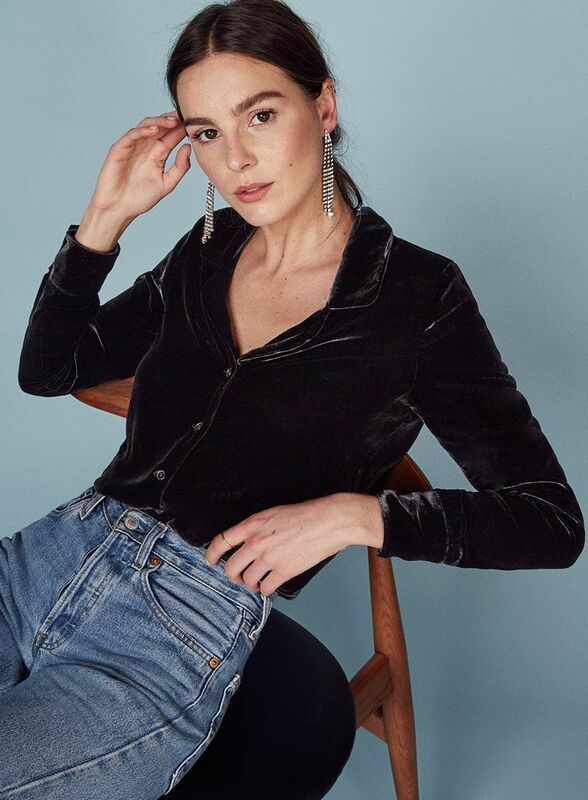 Long earrings are especially good with pulled up hair because sometimes they could get tangled but if your hairstyle is pulled back you are just simply able to show to them to the world. In case your special day is already on your agenda and you are debating on what kind of accessories to go for, then these might be very interesting for you. These long earrings are so elegant and classic, especially if you have an off the shoulder wedding dress. To be more comfortable feel free to make a cute hairstyle with your hair being up. This is a great choice for the ladies who like a very feminine and soft touch to their look. In addition, I would suggest to go for a long dress because they are more appropriate for a classy elegant look. Also, if you don’t want to go for an open décolleté at the front you can wear a dress with an open back. Then add a pair of long earrings that will beautifully compliment your dress. Having long statement earrings means that maybe you should focus on more simple and basic hairdo so you can accentuate your accessories. In addition, if you prefer to include other jewelry pieces such as a bracelet, try to mix and match all of your jewelry pieces. This way you can avoid of being over accessorized. For your special day you can for long glowing and sparkling earrings that will make your wedding look much more elegant and chic. For example, these two crystal pairs from Happiness Boutique. Another special occasion that could be accessorized with a pair of long earrings is prom. Prom nights are very special to every girl. Therefore it is important to look elegant, yet distinctive from anyone else. If you decide to wear a strapless dress the long earrings would be just the perfect choice. To get a more completed look you can always match your earrings to your shoes. These long pieces of jewelry could be the statement of your whole prom outfit if you have a single colored dress. In addition, add a small clutch that could also match your shoes and other accessories and you are all set for your unforgettable night. Princess inspired dresses are also very suitable to be combined with a long pair of earrings. This style is very majestic and glamorous, therefore no matter of your choice of earrings it would still look very chic. Here are two options from Happiness Boutique that could be appropriate for a prom night. Very elegant and stylish, they will definitely make your dress more outstanding and fashionable. Decorate your glamorous looks with a pair of long earrings. Try to focus on longer, rather than chunkier earrings for a more sophisticated style. Here, any type of hairstyle could be suitable. For example, a sequined dress with a deep V-neck that looks very attractive, yet elegant is perfect for a special occasion or celebration. Feel free to only wear your long earrings and make them your accent part of your outfit. Here are two pairs of earrings from Happiness Boutique that could look very stylish with a glamorous night out dress. In addition, these earrings could also be combined with your casual chic or working attires. To get a very classy and trendy look try to get a pair of long pearl earrings. Pearls can always look appropriate with your outfit. However, if you need a pair of remarkable jewelry pieces focus on super long and fashionable ones. Also, these earrings are perfect for elegant outfits or even more simple ones where you can let your accessory to be the focal point of your looks. However, if you need a look that is style Carrie Bradshaw you are more than welcome to try something similar. Duster earrings are always a good idea for more special and glam looks. Yet, if you have a Christmas party at work or a birthday celebration they could also be suitable. Based on the design of the items you can style your hair in a bun or leave it in a very sleek and neat way down. One of the most outstanding, free spirited and catchy are the long boho inspired earrings. They can be as long as you like and on top of that you can add as much jewelry pieces as you want because the gypsy style is all about being over accessorized. To achieve the perfect boho look you can go for earthy color and loose fabrics. For example, a long dress in the beige, brown and sandy color palette. In addition, you can a handbag that also has some boho inspired elements such as feathers and tassels. For this look is better to focus on more slim and longer earrings that will give the illusion of a long and feminine neck. Also, try to get long earrings with boho elements. The bohemian inspired style is great for any season and any occasion, but particularly great for music festivals and traveling. The perfect boho look needs, of course, the perfect pair of boho earrings. These two tassel earrings from Happiness Boutique look so stylish and could suit any of your outfit. In addition, you don’t need to wear them only with gypsy or boho inspired looks. These jewelry pieces are great even with your favorite pair of skinny jeans and a cute simple top. Finally, I hope you find this fashion blog post inspiring and informative. Also, I hope that it will ease your next styling of long earrings and you will end up with the perfect look. Just get creative and experiment with your favorite long earrings and there is no doubt that your outfit will be amazing!